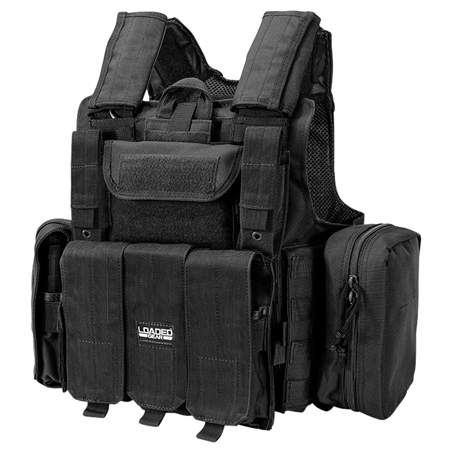 The versatile Loaded Gear VX-300 Tactical Vest helps keep ammo and other essentials close at hand. It features a total of 5 magazine pouches that can accommodate standard 30 round AR-15/M-4 magazines. There are also a number of accessory pouches of varying sizes for storing tools and other necessities. The tough mesh webbing design on the interior of the VX-300 was designed to provide maximum ventilation for the user, and a tough ballistic nylon construction ensures years of service under demanding conditions. An integrated MOLLE Webbing System allows for the attachment of additional items, and is compatible with most MOLLE accessories. Large Velcro areas located on the front of the VX-300 Vest provide space for attaching ID and Morale Patches. In the event that the vest needs to be removed quickly, a quick-release pull tab located on the front of the vest can be pulled to completely remove the vest in seconds.